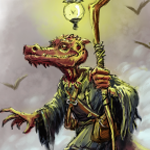 Although many a roleplayer may bemoan the lack of women in our community, I’m here to tell you they are out there, waiting to be enticed by goblins, treasure, and adventures. On Friday, April 12th, I hosted the fifth monthly Queer Geek! 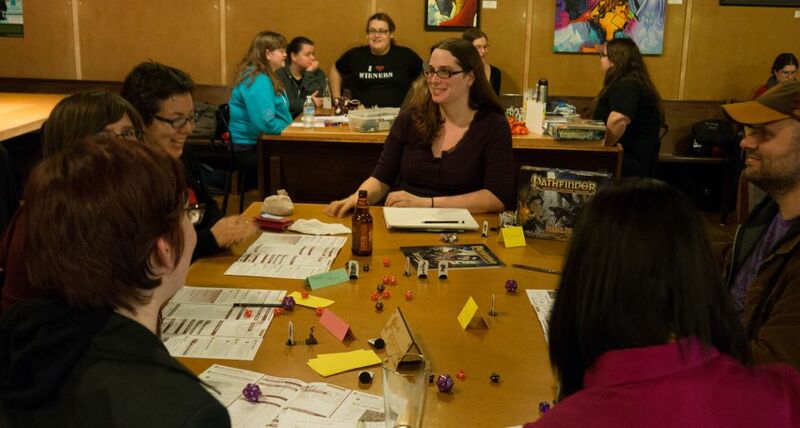 Ladies’ Gaming Night in Seattle, Washington. Usually we all get together and play board games, but this month I invited Paizo out to run the attendees through some Pathfinder games. 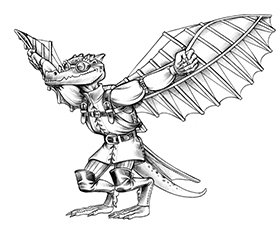 GMs from Paizo included Crystal Frasier, Liz Courts, Sarah Marie Teter, and Erik Keith, and Pathfinder Society GMs were Anna Murray and Dorothy Lindman. We had a great turnout—there were 30 players in six Pathfinder games, and many of the staff from Paizo came out to support their fellow GMs and have a few beers. Paizo provided some goblin plushies, shot glasses, and gaming material for giveaways to the players. 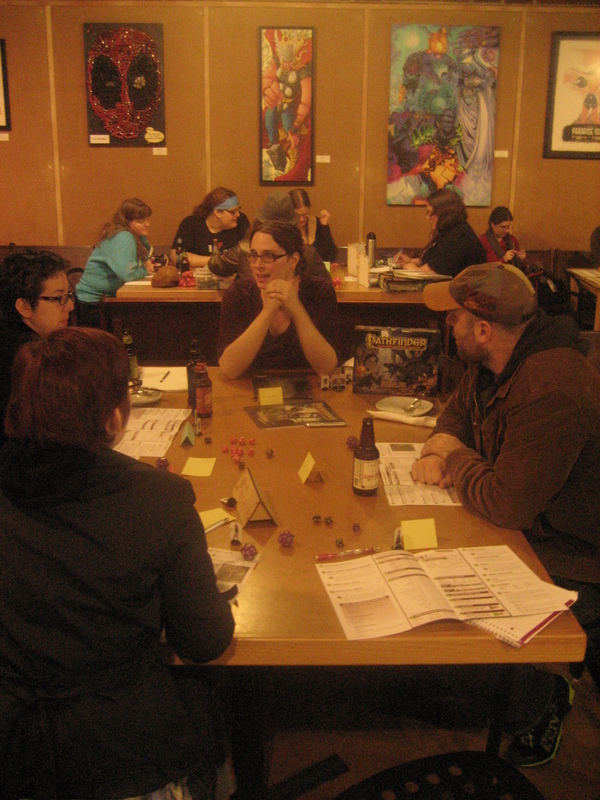 Games played included the Beginner Box and variations thereof, and a couple of Pathfinder Society intro scenarios. Many of the players expressed interest in playing more Pathfinder and possibly doing continuous campaigns at future events. 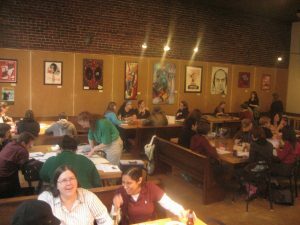 When I started facilitating a monthly Ladies’ Gaming Night at the Raygun Lounge here in Seattle, I had no idea how popular it would be. The initial response was electric—women who I never knew were into gaming wanted to come out and meet other geeky women to play games with. My attendees vary from seasoned gamers to those who are looking to try a new hobby. Our first event had about 40 women show up, and there are new women every month. I started Ladies’ Night so that women gamers would have a night to hang out and meet each other. While we are definitely out there, sometimes it’s hard to find us, especially for those who are intimidated by being the only woman in a room full of men. I host the event through Queer Geek!, and I encourage any LGBT-friendly female-identified individuals to come out and game with us. Men are welcome as well—Ladies’ Night is inclusive, and I ultimately want to bring our wider gaming community closer together. It’s been great getting to game with an awesome group of women over the past few months, and I look forward to doing another Pathfinder night as well as other special events in the future. If you know of any similar such events in your own community, please do feel free to spread the word in the comments field here! And if you have any questions about this particular Ladies’ Night, ask and we’ll make sure we get information to you. Glad to hear it was a success! Very cool. I love seeing new people having fun with rpgs. What a fantastic and needed event! I love how inclusive and welcoming it is. Thank you for hosting this, Ashley! Fantastic to hear about groups like this existing. Even better when gaming companies support the efforts. Had a great night, Ashley! When’s the next one? Thanks Wes! 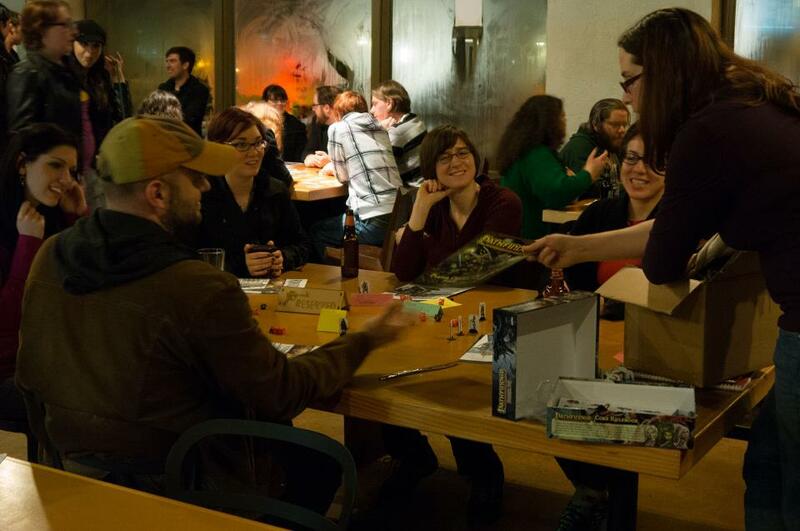 I’ve got a couple other special Ladies Nights in the works, and of course some of them are open board gaming. But I’m definitely planning on having you guys back in a few months! What a disgusting group. Take the radical gay lesbian message out and maybe this will be digestible. What an embarrassment to gamers. It was a fun night! It was awesome seeing *everyone* together having fun. @Laura Melik: What an unfortunate message. Take the radical anti-gay lesbian message out and sadly your comment won’t be digestible – you haven’t noted *one* positive. What an embarassment to yourself, and gaming generally – we are *all* degraded by your bigotry. @Ashley Cook: Wish I was in your area, this event looks like a lot of relaxed fun no matter what your gender, interest, age, race, sexual persuasion, identity or ability. Please keep us updated with your growing player-base and awesome game nights!!! Dang, all the cool stuff goes on in Seattle! Glad to see that many women playing Pathfinder–or gaming, in general–at one place. Keep up the good work!